Special Legislative Concerns: education, jobs, taxes. She was the second woman to be elected to the Minnesota Senate. The first woman, Laura Emelia Johnson Naplin, served from 1927-34. Religion provided by Minnesota Legislative Manual 1975-76. Occupation: President of Nancy Brataas Assoc., Inc. Occupation: President, Nancy Brataas Assoc., Inc. Occupation: President, Management Consulting Firm, Nancy Brataas Associates, Inc.
Party: Independent Republican Party Notes: She was one of the first four Senators to run with party designation since nonpartisan elections had been implemented in the 1914 elections. 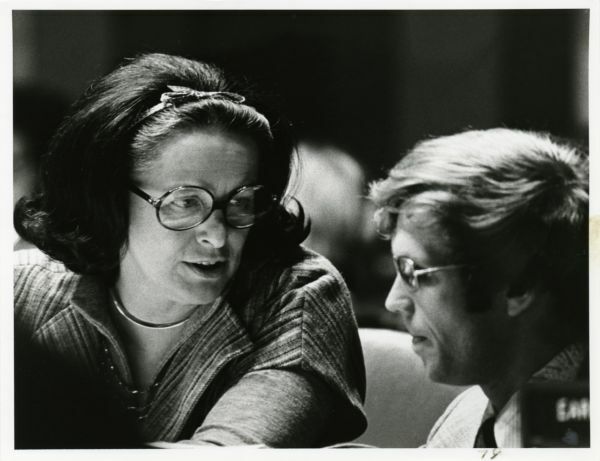 Senator Donald Storm consults with Senator Nancy Brataas during a Senate floor session, St. Paul, Minnesota. 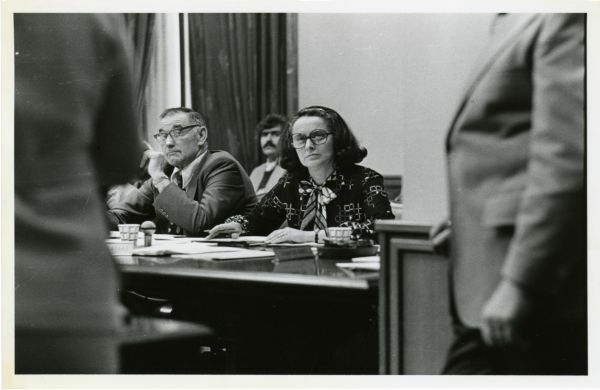 Senator Llewellyn Larson and Senator Nancy Brataas listening during a committee hearing, St. Paul, Minnesota. Senator Nancy Brataas and Senator Jim Nichols confer on the Senate floor, St. Paul, Minnesota. 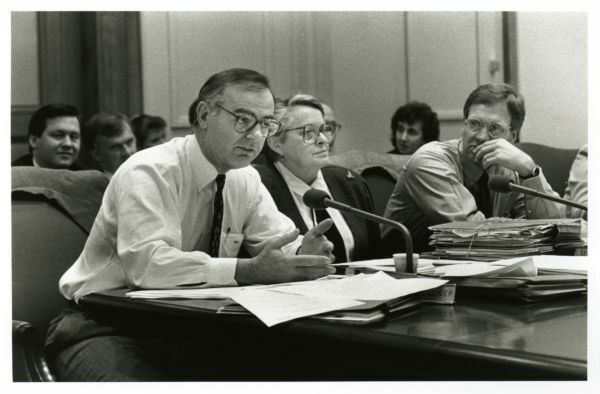 Senator Nancy Brataas, and Senator Duane Benson listen to Senator Roy Terwilliger during a committee hearing, St. Paul, Minnesota. Carlson, Heather J. "Mourners Pay Tribute to Former Sen. Nancy Brataas." Rochester Post-Bulletin, May 12, 2014. Brataas, Anne. 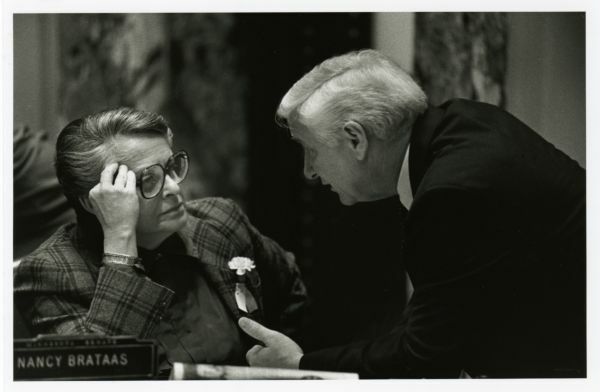 "As She Died, Sen. Nancy Brataas Posed a Final Question: 'Unconventional?'" MinnPost, April 25, 2014. Carlson, Heather J. 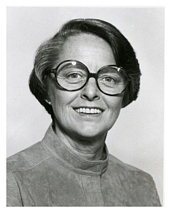 "'Tenacious' Legislator was a Trailblazer." Rochester Post-Bulletin, April 19, 2014, p. 4A. Sturdevant, Lori. "A Pioneer and More: Brataas Helped Build GOP Base." Star Tribune, April 19, 2014. Powell, Joy. 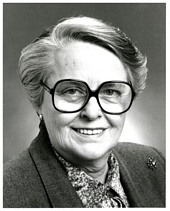 "Nancy Brataas, State Senate Pioneer, Dies." Star Tribune, April 18, 2014. Carlson, Heather J. "Nancy Brataas Defies the Odds Again." Rochester Post-Bulletin, August 30, 2013. "District 32 Senator Begins Term: I'm Learning the Ropes." Senate Perspective '75, St. Paul: Minnesota Senate Public Information Office, March 21, 1975, p. 11.